Contact lenses are ideal for athletes and active folks. They don’t move around when you do. The concerns that come with wearing glasses when you’re playing disappear. 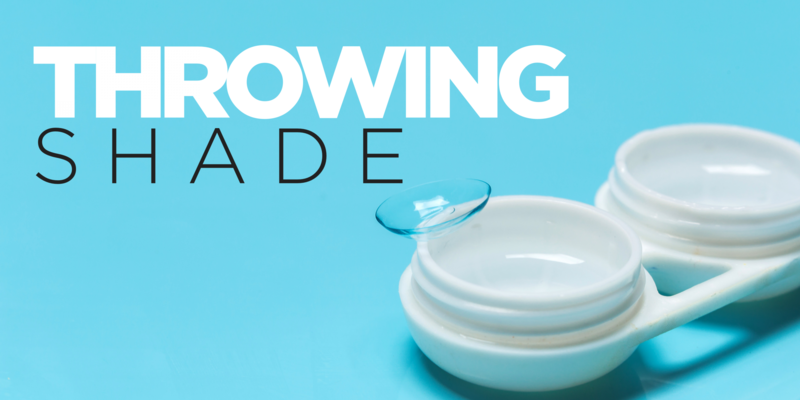 Your contacts aren’t going to fall out, break, or get in the way. Contact lenses are also less obstructive than eyeglasses, so they’re not going to interfere with sporting equipment or headgear—such as helmets, caps or goggles. Eyeglasses certainly can become part of your look (we have a lot to say about eyewear fashion here), but glasses may NOT be a fashion statement you want to make. Maybe not yet. Maybe ever. Or maybe every day. Many people that like to jazz-up their eye makeup find glasses get in their way. Some people simply don’t like how they look in glasses. So yes, your personal style might be all the reason you need to become a contact lens buyer. You may or may not know contact lenses come in an array of shades enabling you to change the appearance of your eyes. You can get radical with temporary color changes or opt to adjust your look more naturally or subtlety. 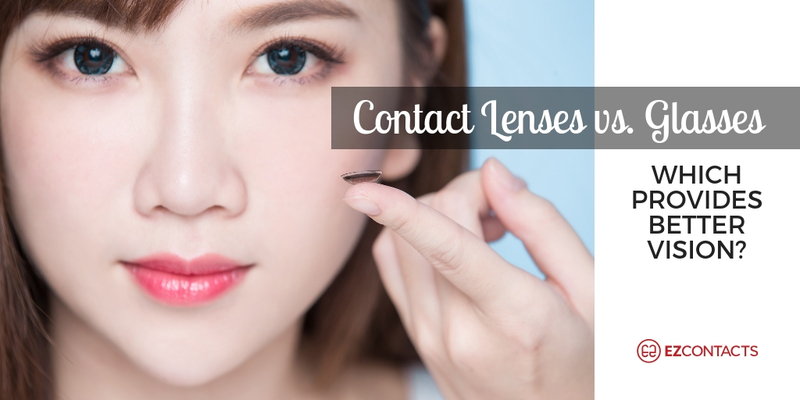 EZContacts offers a range of colored contact lenses here. “They don’t get in the way when I’m kissing.” Maybe contacts are more romantic? The best reason to go with contacts is to deliver the vision solution you need. Contacts sit comfortably on the curvature of your eyes, which can give you a wider field of view compared to glasses and excellent focus. Weather conditions such as fog and rain won’t affect your vision. You’ll never have to worry about scratched lenses (and the cost of replacing them). Glasses can get foggy. Contact lenses will not. You don’t need to touch your eyes to wear eyeglasses. Some people struggle with applying their contact lenses (though most tend to catch on quickly). Eyeglasses require very little maintenance whereas certain types of contacts must be cleaned regularly. 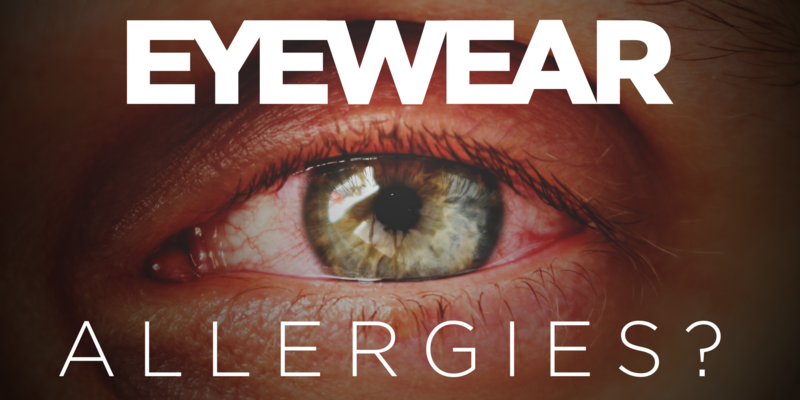 Some contact lens users experience dry eye syndrome. Those that fall asleep wearing contacts complain of irritation when they wake. In the long run, wearing glasses will be the less expensive option. Many people simply like wearing glasses because they can make a fashion statement. Certain types of eyeglass lenses—photochromic—can adjust the amount of light entering your eye to help with comfort and vision. Photochromic lenses also block 100 percent of UV rays to provide eye protection. *Note, however, in 2018, the FDA cleared the first contact lens to incorporate an additive that darkens the lens when exposed to bright light. The lenses adapt the amount of visible light filtered to the eye based on the amount of UV light, filters blue light and blocks UV rays. Contact lenses are not all the same. In fact, as the use of contact lenses has grown since the mid 90s, so too have the types of solutions you can use. Soft lenses emerged in the 1970s. They’re made of hydrogels: plastics that contain water. The lenses are very thin and pliable and therefore comfortably conform to the surface of the eye. Silicone hydrogel lenses are by far the most popular lenses prescribed in the United States. An advanced type of soft contact lenses, they’re more porous than regular hydrogel lenses so they allow more oxygen to reach the cornea. 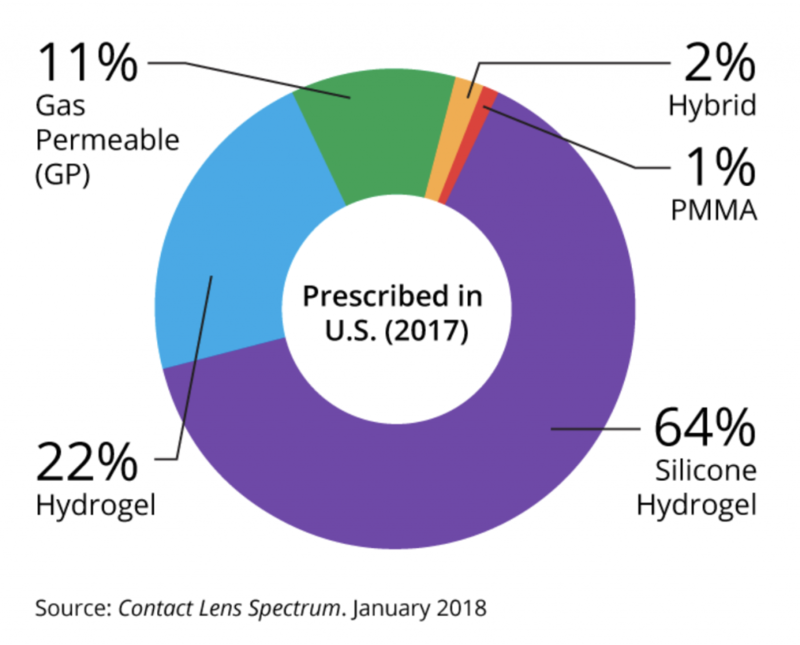 The two types of soft contact lenses now comprise 86% of the U.S. market. Gas permeable lenses are rigid contact lenses that look and feel like PMMA lenses (see below) but are porous and allow oxygen to pass through them, making them more comfortable than conventional hard lenses. This type of lens often provides sharper vision than soft contacts, especially if you have astigmatism. It may take time to adjust to gas permeable lenses, but most people soon find them as comfortable as hydrogel lenses. Hybrid contact lenses are designed to provide wearing comfort that rivals soft lenses but deliver the optical benefits of gas permeable lenses. Hybrid lenses feature a rigid gas permeable central zone surrounded by soft lens material. Only 2% of people in the U.S. wear hybrids as they are more difficult to fit and more expensive. 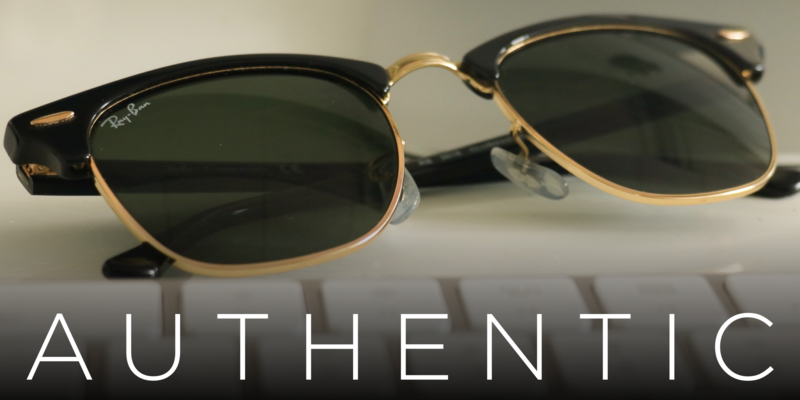 PMMA lenses are not obsolete but are rarely prescribed now. Made from a transparent rigid plastic material called polymethyl methacrylate (PMMA), the lenses have excellent optics, but do not transmit oxygen to the eye. Contact lenses are bound to be more expensive than glasses. It typically takes more time to get used to wearing them and they may require more follow-up care with your eye doctor. And unlike contact lenses, glasses are suitable for all ages. However, contact lenses are immensely popular for the reasons we’ve covered. Most people can wear contacts successfully, even if they prefer to wear glasses as their primary form of vision correction. Ultimately, the choice you make is a matter of personal preference based on your lifestyle, comfort, convenience, budget and aesthetics. The powers specified may be significantly different than those on your eyeglasses. Should you choose contact lenses instead of—or in addition to—wearing eyeglasses, be sure to get a content lens exam and fitting from your optometrist.